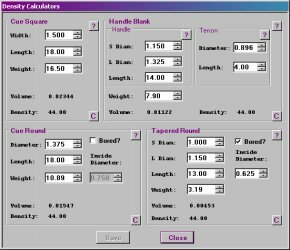 Cue Balance is a fully featured windows program developed for the custom cue maker to help in weighting and balancing a cue during the design and construction phases. 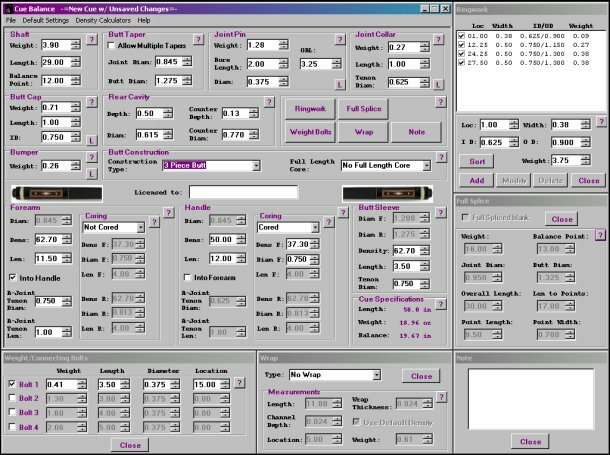 I started writing CueBalance because I wanted a tool to help me match certain woods and make coring decisions in order to achieve a specific weight and balance point of a cue. At some point, the program evolved into a challenge to try and incorporate as many aspects of cue construction as I possibly could in order to develop an actual cue modeling program. I feel the end result is a worthwhile contribution to cuemaking, and so I have decided to offer it for sale to other cue makers. The introductory price is $100. This includes lifetime email support, and telephone support during the initial installation. You can purchase CueBalance by clicking on the paypal button above. Once purchased, a personalized version of the program will be compiled and a download link will be emailed to you within 24 hours. A wise man once said if a picture is worth a thousand words, a video is worth a lot. I agree. At the bottom of this page are 3 youtube video links. The videos highlight how to use CueBalance. If you are a cue maker and might be interested in purchasing CueBalance, the videos will give you an idea of how my program can benefit you during the cue design and construction phase.